Understanding if people are working on the right tasks can make or break your business. If 40% of all employee hours are spent on non-billable projects but your company needs to log 80% to billable projects, then clearly priorities need to be set to ensure everyone is on the same page. Capacity is a visualization of all the billable and non-billable projects your users worked on, against their total weekly capacity. If you’re on the Essential plan, the first thing you’ll see when you enter the main People page is a list of your active users against their capacity bars. Note: Limited users do not have access to the People page. The default weekly total is set to 40 hours, but you can change it across your whole account in Settings > Global. Select either a monthly or weekly capacity timeframe from the People main page. 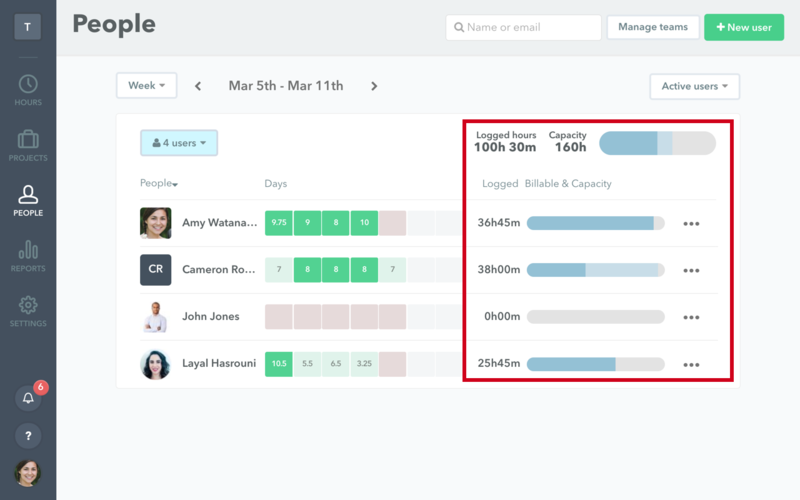 A weekly capacity view can help you schedule upcoming events, while the monthly view helps identify employees close to burn-out and those who aren’t consistently logging hours. By default, all active users will be listed. To filter down by User name, click the users drop-down and select who you want to see. 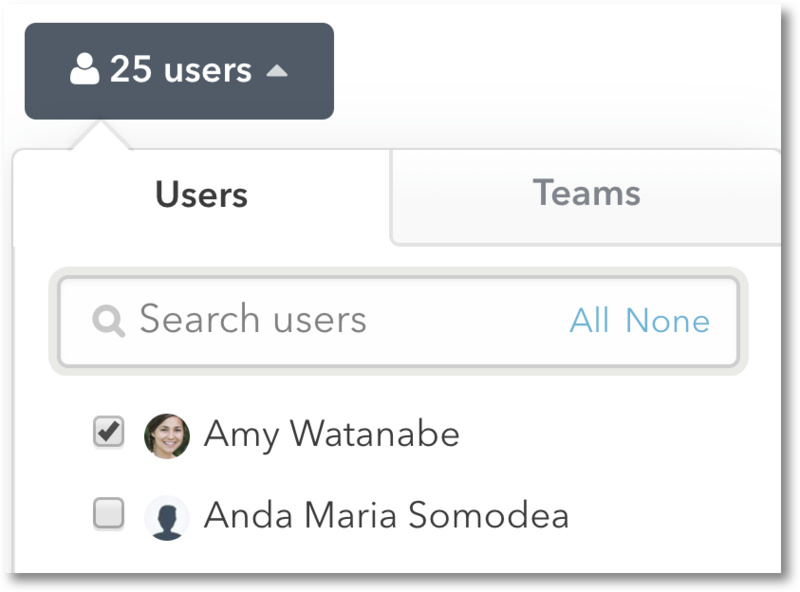 Toggle to the ‘Team’ tab to select from your list of Teams or grouped users. Entering a User or Team name in the search bar will auto-populate available selections for you. In the upper right-hand corner of the chart, you’ll see the total logged hours and available capacity for all users on the account. You’ve selected your database of users, now let’s explain what you’re looking at. Hover over the bar to reveal the details of each color in the bar. Using this information, I can see that this user spent all their hours on billable project and worked almost an hour of overtime for the week. This means they’ve likely logged all their hours for the week. Let’s say you’re pursuing a new client and need to understand if you have capacity for more work. You also need to give the client a realistic expectation of project delivery speed. Let’s break-down this example to see if my company can take on a new project. Pulling up the Capacity data from last week, I can see that my company logged around 100 hours out of a total 120 hours available weekly capacity. Layal logged a total of 25 hours (15 hours short of a normal working week). A peek at the office calendar shows me that she was out of the office on vacation. I can add vacation hours to her timesheet, bringing her weekly total to 41 hours with 16 hours logged to non-billable projects. Cameron logged almost a complete working week, but only 42% of his time was spent on billable projects. The other 52% was spent on non-billable projects! Clicking his name directs me to his User page. After analyzing his recently logged hours, I realize he spent a majority of his time on product training and is now ready to pitch in on billable projects. I just found the key to unlocking more billable hours! 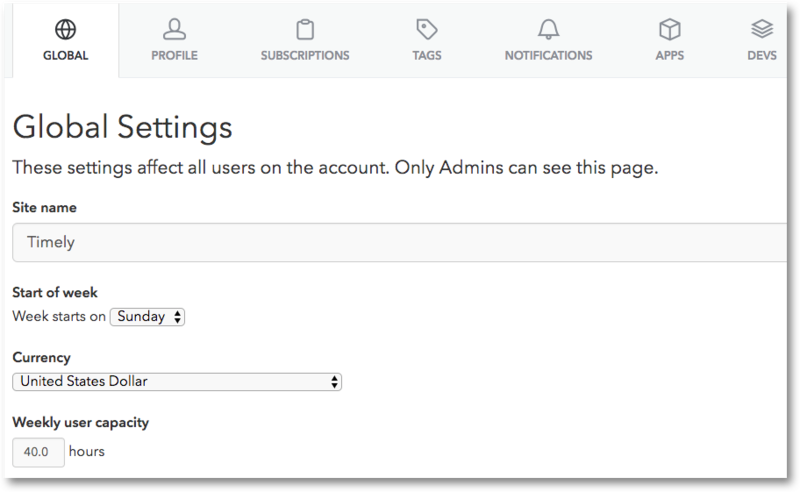 Using the data from the Capacity feature, Admin and Normal level users can schedule hours for other users with Timely’s Company View feature. You can set aside hours for an incoming project, ensure a certain user will finish a particular project by its deadline, or log vacation hours for employees who are out of the office! Now you’re running like a well-oiled machine!